This dress was an experiment in sizing. I am right in the middle of Burda regular and plus sizing, and I was interested in how a plus pattern for wovens would stack up against a regular size. I chose this dress from the May 2012 issue. I really liked the line drawing, and draping and V-necks are two of my favourite design elements. My fabric is a digital printed cotton voile, and I’m happy that everything for this dress was from stash! I cut the size indicated by my full bust measurement. I wanted to see how this compared to cutting my upper chest measurement and doing an FBA. I shortened the waist by 2 inches, which is a standard short-waist adjustment for me, and cut the fronts with 2 inch seam allowances. Verdict: the smaller size with the FBA would have been a better fit across the chest and through the armscyes. 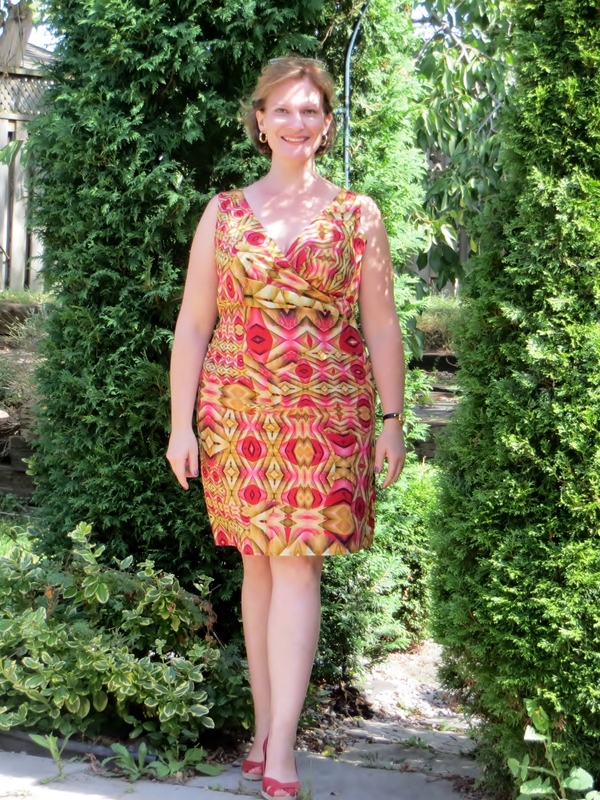 As it was, I needed to ease in 2 inches along the length of each neckline to get the neckline to lie snug and avoid wardrobe malfunction, and it was a good thing I cut a 2″ seam allowance through the armscyes. I needed that much to get enough coverage and avoid gaping armholes. The one odd thing about this pattern was the right front. In order to get the fit and drape through the waist and hips (surprise on the hips) I had to trim 1 1/2″ off the entire right side seam. Not the left, just the right. A drafting issue? Anyways, I wore the dress today, and it was super comfortable and cool. The back fits well after tweaking the fit through the waist, and I really like the silhouette of the a-line skirt. The dress is fully lined, but I drafted facings to give the edges a nicer finish. Well, two summer dresses down and one to go! I’m almost at the end of my late summer projects. Now that´s a great dress! And the print? it´s great! Another beauty! This is soooooo pretty and I love, love, love the print you chose for this! Lovely dress, I always enjoy seeing the colors you choose. They are ones I can’t wear myself, but they always look wonderful on you. I am mid way between reg and large size Burda’s on pants. I have found, like you, that making the regular size and added where necessary (waist) works better than making the large size. Isn’t it mind boggling the way patterns change so much when jumping to the next size level…do designers have ANY idea of what women’s bodies do with a couple extra pounds? Back when I was a teenager in the 60’s pattern companies and clothing designers put out garments and patterns called “half sizes” which were shorter waisted, and wider bodices and hips and then all that disappeared. I remember whole areas of this clothing in department stores and pattern catalogs…so now we are left to do all that altering alone and you have done a superb job with leaving extra wide seam allowances and making one side wrap better over the other…strange to have to do that by 1.5 inches but the outcome is beautiful! Well, I cut these out because I couldn’t sew for most of the summer. Once the garments are cut, sewing them up it the easy part, I find. Fitting adjustments take a lot of time, and that makes the cutting of garments the part I dread the most. Once I know the fit is good, then I can cut and sew!